Hi, my name is Axel. I’m nine years old. I have been coming to tutoring at Family Matters for two years. I come two times a week and I work on reading with my tutors. This summer, I came to Family Matters on Wednesdays and Fridays. My tutor and I made a volcano. We made this because we read about it in a book. The book was That Crazy Eddie and the Science Project of Doom by Judy Cox. It’s a chapter book. I read the book at tutoring and at home. The book is about two friends, Matt and Eddie. They heard in their school about a science project competition. (A competition is like a battle or a contest.) Matt wanted to win the contest because the prize was a fifty-dollar gift card. He wanted to buy himself a skateboard. Matt asked his best friend Eddie to be his partner. Eddie said “yeah, sure” because Eddie’s dad was a scientist. Eddie had a lot of good ideas about science projects. Eddie decided he and Matt were going to make a volcano that would erupt. While they were working on the project, they got in a fight. Matt had to stay home from school one day because his stomach felt weird. When he got back to school, other kids made fun of him. Matt found out that Eddie told the other kids Matt was sick. So, Matt was mad at Eddie. They only had one day before the contest, and their project wasn’t finished. That day, Matt’s little sister climbed on their roof because she wanted to play with their cat, Mittens, who was up there. Matt’s mom was gone. Matt was scared. Matt ran down the street to Eddie’s house and told Eddie. He wanted Eddie to help him. Eddie helped Matt get his sister off the roof. Eddie’s sister said that they should be friends and enter the contest. They decided to finish their project that night. They did the contest, and they lost. They got third place. Matt didn’t win the money to buy the skateboard. Matt felt kind of sad. He also felt kind of happy because he decided that having his friend back was more important than getting the skateboard. I liked this book because I liked reading about the volcano. And I liked that Matt and Eddie stayed friends and worked things out and they helped Matt’s sister get down from the roof. After the last chapter, there is a section called “How to Make a Volcano That Really Erupts.” My tutor and I read it together and we found out what tools we needed to make a volcano. I brought some things from my house, like a cardboard box, flour, and 2 dinosaurs (for decoration). 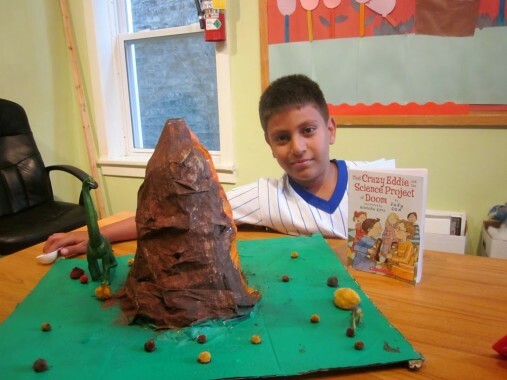 It took three days to make the volcano. On the first day, we got an empty Pepsi bottle and put masking tape from the mouth of the bottle all the way down. Then we put newspaper into warm water and flour to put around the tape. We had to measure the exact amount of flour and water we needed. Then we let it dry. The next tutoring session, we painted it. The next tutoring session, we used baking soda, vinegar, dishwashing liquid, and red food coloring to make it erupt. We used a funnel to pour everything in. After we poured everything in, we waited. Nothing happened. We tried again and nothing happened. We decided maybe it didn’t work because the baking soda was expired. We walked across the street to the store and got more baking soda. Then we poured everything in again. Then nothing happened again. The next time, we poured in a lot more vinegar than the directions said, until it exploded. I loved it when it exploded! I liked making the volcano, too. Next time, I want to put more red food coloring in it so that it would be more red.